Now, a project developed through an MIT class has come up with a highly energy-efficient design for a large community building that uses one of the world's oldest construction materials. For this structure, called "the Longhouse," massive timbers made of conventional lumber would be laminated together like a kind of supersized plywood. John Klein, a research scientist in MIT's architecture department who taught a workshop called Mass Timber Design that came up with the new design, explains that "in North America, we have an abundance of forest resources, and a lot of it is overgrown. There's an effort to find ways to use forest products sustainably, and the forests are actively undergoing thinning processes to prevent forest fires and beetle infestations." One of the first questions people raise when they hear of such construction has to do with fire. Can such tall wooden structures really be safe? In fact, Klein says, tests have demonstrated that mass timber structures can resist fire as well or better than steel. That's because wood exposed to fire naturally produces a layer of char, which is highly insulating and can protect the bulk of the wood for more than two hours. Steel, in contrast, can fail suddenly when heat softens it and causes it to buckle. "The structural depth achieved by building up the triangular section helps us achieve the clear span desired for the communal space, all while lending a visual language on both the interior and the exterior of the structure," says Demi Fang, an MIT architecture graduate student who was part of the design team. "Each arch tapers and widens along its length, because not every point along the arch will be subject to the same magnitude of forces, and this varying cross-section depth both expresses structural performance while encouraging materials savings," she says. "The Longhouse is a multifunctional building, designed to accommodate a range of event scenarios from co-working, exercise classes, social mixers, exhibitions, dinner gatherings and lectures," Klein says, adding that it builds on a long tradition of such communal structures in cultures around the world. Whereas the production of concrete, used in most of the world's large buildings, involves large releases of greenhouse gases from the baking of limestone, construction using mass timber has the opposite effect, Klein says. While concrete adds to the world's burden of greenhouse gases, timber actually lessens it, because the carbon removed from the air while trees grow is essentially sequestered for as long as the building lasts. "The building is a carbon sink," he says. One obstacle to greater use of mass timber for large structures is in current U.S. building codes, Klein says, which limit the use of structural wood to residential buildings up to five stories, or commercial buildings up to six stories. But recent construction of much taller timber buildings in Europe, Australia, and Canada—including an 18-story timber building in British Columbia—should help to establish such buildings' safety and lead to the needed code changes, he says. 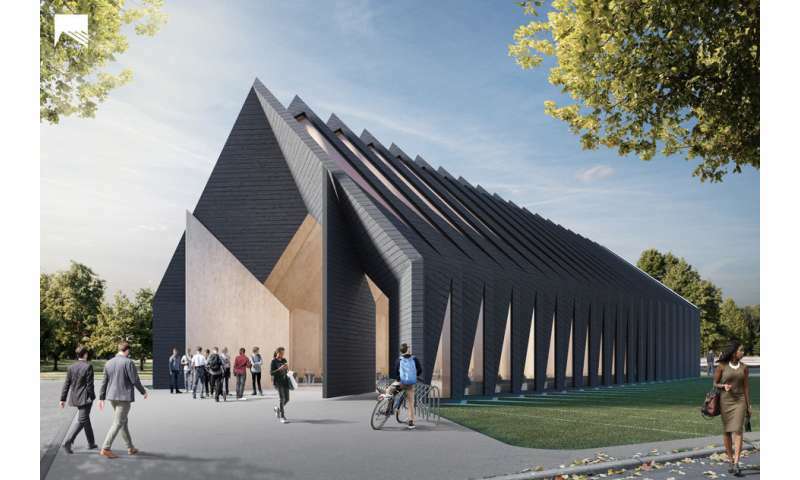 The Longhouse design was developed by a cross-disciplinary team in 4.S13 (Mass Timber Design), a design workshop in MIT's architecture department that explores the future of sustainable buildings. The team included John Fechtel, Paul Short, Demi Fang, Andrew Brose, Hyerin Lee, and Alexandre Beaudouin-Mackay. It was supported by the Department of Architecture, BuroHappold Engineering and Nova Concepts.